« TSS: Best. Week. Ever. When Alice’s Aunt Polly passes away, she takes with her the secret to her world-famous pie-crust recipe. Or does she? In her will, Polly leaves the recipe to her extraordinarily surly cat Lardo . . . and then leaves Lardo in the care of Alice. Suddenly Alice is thrust into the center of a piestorm, with everyone in town trying to be the next pie-contest winner … including Alice’s mother and some of Alice’s friends. The whole community is going pie-crazy . . . and it’s up to Alice to discover the ingredients that really matter. Like family. And friendship. And enjoying what you do. If you are looking for a fun mystery for the middle grad kid in your life, look no further than Pie! If that kid likes to bake, sorry but you need to buy this book – you can’t just get it from the library. You need to buy it so they can try to make all the pies in the book! The recipes really take a cute, fun book into something special. Reader can read about the best pies ever made, then try to make them for themselves (with parental supervision of course!). The story is really great. The only part I didn’t like is that best character is dead by the time the book starts. Polly is so loving and sweet. She cares about the whole town and is such an amazing and fun character to read about. I wish we could have seen her a little more – though it makes total sense within the book. This book is full of great messages and can lead to some great conversations between parents and their tweens about friendship, family, and the importance of communicating with family. There was a particular scene with Alice that was very powerful when she lets her mom know that she doesn’t feel like her mom loves her. It was heart-breaking, but the results of the honesty were very touching! This book was perfect for the audience and I hope you share it with others! This entry was posted on September 29, 2011 at 12:27 pm	and is filed under Review. 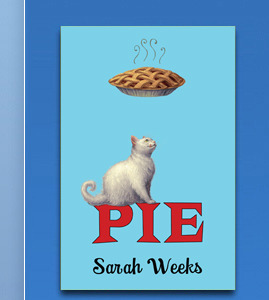 Tagged: middle grade, pie, sarah weeks. You can follow any responses to this entry through the RSS 2.0 feed. You can leave a response, or trackback from your own site. I got this at SIBA and just adore the cover. I’m glad the book lives up to it.